Just got my Sony Nex6. OMG it’s small. I am amazed. This is not a review, those are easy to find out there. This is just my first impressions. I’m coming from a long history of SLRs and DSLRs. Olympus OM-1 in 1977, Nikon 90S 1995, D70 2004, D300 2008 – to preserve my Nikon lens investment. And later a 18-200 VR lens. A couple of years ago I got bored with photography, mostly because the camera was just too heavy to lug around. I’ve been using Nikon Coolpix and more recently a Pentax WG-II which is great on sandy beaches and rain storms. But I missed shooting raw. Recently I went looking for an updated Raw camera. I’d heard that the Sony Alpha series was a break through camera series with no mirror or penta-prism. Smaller, lighter and cheaper. Well my first impression is that I can get excited about photography again. Like I said, this is not a comprehensive review. Just a first impression after a few hours. The Sony lens is a 16-50 zoom, not the 18-200 VR zoom. Eventually I’ll get that lens for the Sony. Of course the Sony has a lot of features. Six years means a lot with Moore’s Law has a lot of effect after three or four iterations and camera’s are definitely on that curve. But the real breakthrough with this camera is that Sony tossed out the old thinking about how a high performance camera should work. There is no longer any need for a flapping mirror or a though the lens optical view finder path. This is the primary thing that makes this camera so much smaller. 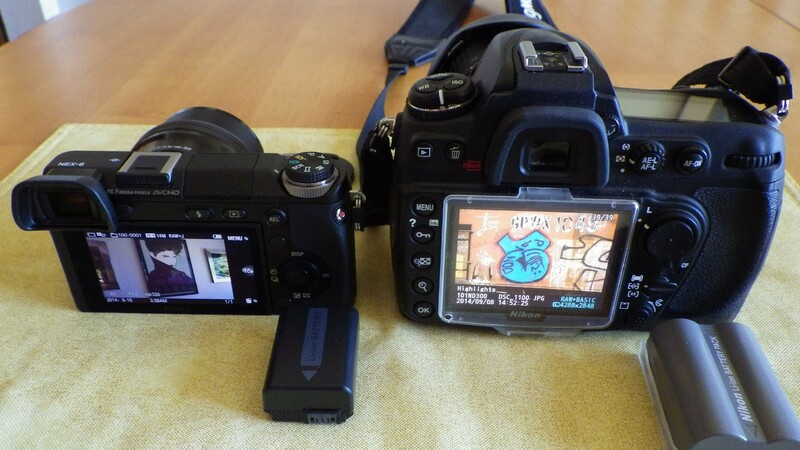 The sensor’s in the two cameras are the same size. Both APS-C, and both built by Sony by the way. The sensor is about 25 x 17 mm. Not tiny like the ones in your cell phone. Not full frame, although Sony does make a full frame sensor version of this small camera. But the price point for this camera is also a killer feature. While it lists for $899 with lens, you can get it now for $499 with the lens. That’s basically the lens for free, and it’s a very nice lens. Mostly because it collapses to a very small size when you turn off the camera. 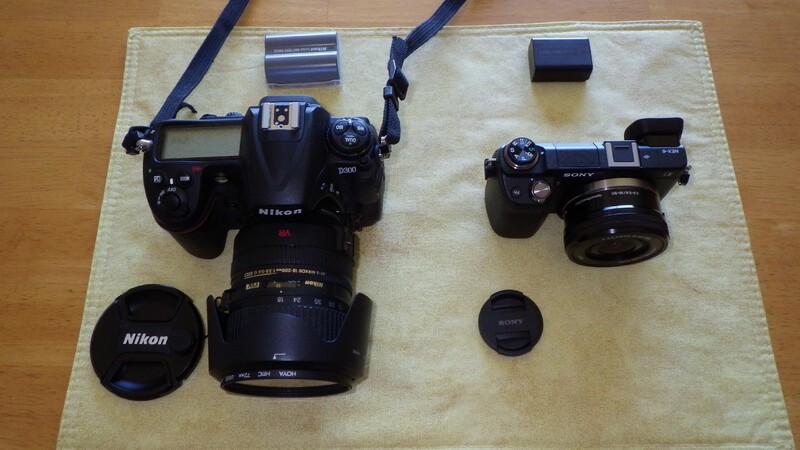 I predict that Nikon and Canon are both working on mirror-less bodies. If they are not doing that, then are going to be left behind by those who do. 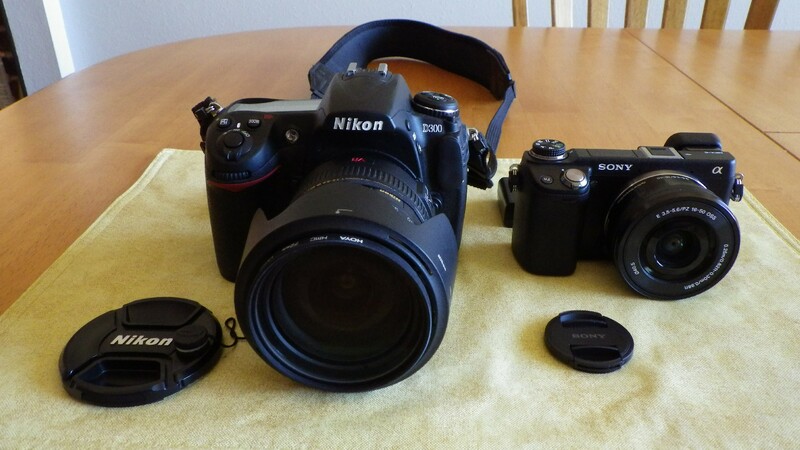 I will go out and take another hike along the coast to show off this camera in comparison with the D300. You can see my recent D300 coast hike here, with some help from RawTherapee 4.1, of which I am also a fan.